The waistline has always been the subject of wearable fanfare, with fitness trackers and wellbeing wristbands the golden children of non-invasive health and fitness devices. Though many health and fitness apps include a food diary function, they typically require users to self-report what they've eaten. As yet they've failed to fully achieve their presumed aim; to be an electronic companion for people who want and, moreover, need to accurately monitor their diet. Ingestibles did have their moment in the spotlight, but have so far struggled to reach any sense of universal applicability and mainstream appeal. It seems we just can't shake off those images of Innerspace. This could be about to change. For people with conditions such as hypertension and diabetes, eating too much salt can increase blood pressure and can lead to heart complications. In instances such as this, self-reported data is crucial for doctors and nutritionists to assess patients. Researchers at the Georgia Institute of Technology may have found a wearable solution in the form of a salt sensor. The intraoral, ultrathin mouth wearable uses Bluetooth to report daily salt consumption to an app, in order to help people monitor their sodium intake without having to write it down in a diary. Woon-Hong Yeo, assistant professor in the Woodruff School at Georgia, hopes the device – thus far tested in three separate studies – will help people for whom salt can be dangerous to change their eating habits. The researchers are aiming to remove the battery connected to the elastomeric membrane and also reduce the size of the device to the size of a tooth before testing starts again. Similarly, this tooth-sticker can track glucose, salt and alcohol intake and also transmit nutritional readings to a chosen device. Developed at Tufts University in Massachusetts, the tiny 2mm-by-2mm tracker is built with biosensors that register saliva-based compounds as they pass the wearer's teeth. Researchers say the unlikely wearable will be able to detect a range of other substances too, and thus help to build a database of food that could then be given to a doctor as a digital substitute for a nutrition diary and management system. For those struggling with obesity, tracking food once it's been consumed is only one part of the solution to losing weight; another is to be aware of the amount of food you're putting into your body in the first place. Portion control could be the answer. 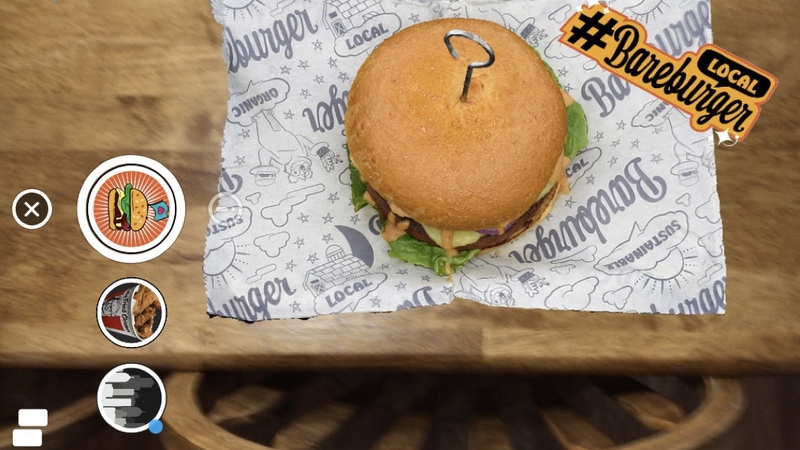 Augmented reality company Kabaq has created an entire menu in 3D and, partnering with Snapchat, customers will be able to view the menu items by scanning the matching Snapcodes. The pop up menu is being trailed at US restaurant chain Bareburger this July. The setup is smartphone based for now but we could see this feature translating well to future smartglasses. It's not only AR tackling the dietary needs of the future human. Two recent studies have also revealed how virtual reality could help people to deal with eating disorders and even food poisoning. Researchers at France's University Hospital of Brest have reviewed years of data from clinical trials regarding VR's relationship with eating disorders, such as anorexia and bulimia, and concluded that it could be used as a promising therapeutic tool. Any successful application would need to apply cognitive behavioural therapy (CBT) techniques and on-hand therapists, the study concluded. With inches separating a win or a loss, nutrition and body conditioning is a way of life for many athletes. It makes sense then that a lot of the advances in health surveillance can be found here. The Women's Tennis Association (WTA) has provided players with a fingertip pulse oximeter, which provides non-invasive measurements of pulse rate and hydration, for example, to ensure players on the pro circuit can train risk-free at optimum times. Meanwhile, basketball player Omri Casspi has invested in a startup designed to analyse the DNA of gut microbiomes to provide personalised dietary needs for an individual's nutrition profile, developed from a stool sample and a blood test. It's believed matching foods with gut microbes can optimise an athlete's performance. Anything for an edge over the competition. This sort of behaviour is trickling down to devices aimed at amateurs as well. RocketBody's wearable incorporates an AI nutritionist and trainer to balance training routines and recovery time using EKG readings to determine an athlete's metabolic rate and then recommend a plan for workouts and meals. We're also set for another wave of calorie counters with the Healbe GoBe 2 leading the charge – look out for a review of this device soon. We asked Melanie Hargraves, a nutrition scientist at the British Nutrition Foundation, what she thought of these wearables. What do they need to do in in order to be useful and accurate? "While technologies that allow people to monitor their food and nutrient intake have the potential to provide support for people to improve their diet and lifestyle," says Hargarves, "there is very little research available on how effective they are." An issue with mouth wearables, for example, is one of robustness. Could the tooth-sticker survive a week in the mouth of a heavy chewer? And even if it did last long enough to make an assessment of someone's eating habits, how reliable would this data be? It even could be as unreliable as self-reporting, with the pitfalls of people forgetting to report certain meals or poorly estimate how much they've actually eaten comparable to inaccurate biosensor readings. Foods are a mash of compounds and when mixed with saliva it can be hard to unequivocally monitor salts and sugars, say, especially when variables include the way they're cooked or consumed. In other words, the measurement detected in the same foods and dishes may differ. And we all know the perils of glucose tracking. But if we are able to evaluate and learn about the role of technology in health promotion, as Hargraves is hopeful of, we could start to see quality scientific studies carried out, demonstrating the application as well as the accuracy of the wearables shown here – and beyond. If so, it might not be long before emerging technologies start to impact our daily dietetic routines, whether that's being told via an app that we're eating too much salt, or slotting on a virtual reality headset for a weekly bout of food-based therapy. Look out fitness trackers, the digital nutritionist is coming.